A baby monkey was born in the London Zoo only three weeks ago. The London Zoo welcomes the baby monkey’s coming. The monkey’s mother is always with the baby monkey, so we don’t know if it is a boy or a girl. The little monkey currently measures only three inches(英寸). The mother and the baby are in the zoo’s “Meet the Monkeys” exhibit. It means that you can actually walk among the monkeys. The monkeys live in large groups. Older monkeys all like taking care of(照顾) the baby monkey. 1. The baby monkey was born _____. 2. 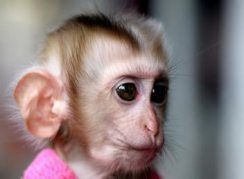 Why do not we know if the monkey is a boy or a girl? A Because the mother monkey is never with the baby monkey. B Because the mother monkey is never with the baby monkey. C Because the father monkey is always with the baby monkey. D Because the mother monkey is always with the baby monkey. 3. What does the underlined word “measure” mean in Chinese? 4. The monkeys live in _____ groups.